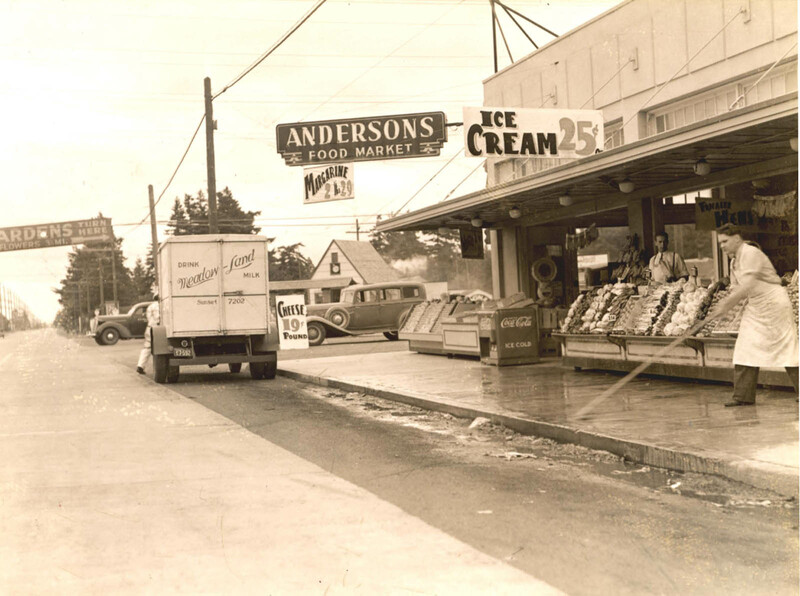 It appears the Anderson’s Food Market staff is cleaning sidewalks and stocking produce for another business day at SE 82nd & Powell in 1939 1937. Parking a delivery truck at the curb in those days didn’t seem to be a traffic problem like it would today. We’re looking south on 82nd here. NOTE: Other photos of this area indicate this dates to 1937, not 1939. I really like this photo. My uncle was a milkman for Bordens, down south in Mississippi. Who knows which gardens the sign across the street mentions? I’m curious. Thanks! I remember playing LL baseball at the Meadowland Dairy. Approximately 162nd and Powell. I think the dairy trucks were yellow and blue. I think it’s a trailer park now. I remember going by there as a kid when we would pick my Dad up from work. That is is a sign to Lambert Gardens. 3 and a half miles would take you to 28th and SE Steele which is where the garden was. Wow! Thanks for the image. Looks like that scrubbed down sidewalk was turned into part of the sales floor on a daily basis. Nice to see my old neighborhood. Thanks! @ rumblefish. Meadowland was the league to beat back in the day. I played for Lents LL in the early 1970’s and remember going to district tournament games at Meadowland field. I recall sliding down the north side of Powell Butte (pretty sure that it was Powell Butte haha) on a piece of cardboard during lulls in the action. Meadowland LL is now called Centennial LL, and relocated to public school property near 181st and Division. Meadowland field was a great place to play and shame that it turned into a trailer park. Unfortunately, most of the Portland area little leagues in existence back then are no more. Most neighboring leagues have merged, so there are far less teams at tournaments. Back then baseball was everything to us kids, but now there seem to be so many more options for kid entertainment, some of it not so healthy. Meadowland Dairy on Powell Butte or Wilson Hill as we called it. The proportions look similar, but Portland Maps says that the existing building was built in 1945. It’s in about the right spot isn’t it Dan? I didn’t think ANYTHING would be left in the picture but… if it were remodeled then yeah that COULD be the building. I was curious about the same thing. I don’t think it is the same building. My guess this is the NW corner of 82nd and Powell facing looking south. 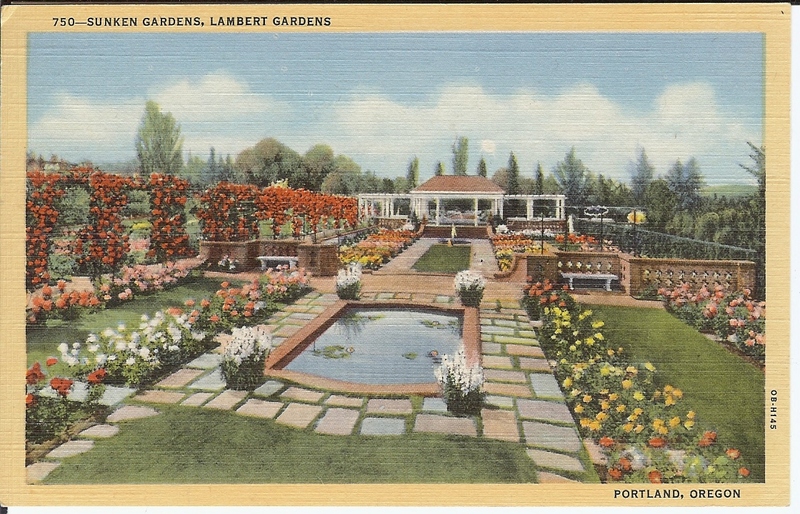 If this was the same building, wouldn’t the Lambert garden’s sign would be on Rhine Street? Looked up Lilybel Gresham who apparently helped her Uncle with the Gardens. Looks like she died without marrying. Probably related to the Greshams that set up the first PO in the area. I can’t remember what Anderson’s Food Market name later was changed to, on the SW corner of 82nd and Powell another market was built there and was called Sueters Market( may have spelled that wrong) which was owned by my Dad’s cousin for many years and now houses an unfinished cabinet store. My Dad’s cousin then owned a market at 91st and Powell for many years. We lived at 81 and Woodward at the time(1955 to 1960). There was a big field behind Anderson’s that us kids used to play in and when my folks would send me to the store, I would cut through this field. About 1957, a fireworks factory located a few blocks east on Powell blew up one night and my folks and I walked up there. When we got to the markets, all their windows were blown out, and all the items on the shelves were on the floor. Glass jars were shattered, and what a mess ! Pickles and sour kraut and such mixing on the floor, YUK ! Wow, thanks for the info Fred! Also want to add. My parents remember the fireworks factory exploding. My Dad sent my Mom and sisters into the basement, because he thought that we were being bombed. Hi Ric, I think somewhere I might have a picture or two, but I couldn’t say where they are right now. I just inherited all my folks belongings after my Dad passed last Christmas. Before we lived on SE 81st, we lived at SE 96 2 houses off Holgate. The house was moved to make room for 205. I remember the fields, it was before Eastport Plaza was built. My mother was learning to drive then and we almost wiped out the Shell station on the corner of 82nd and Holgate, lol….. When the fireworks factory blew, it sent a huge mushroom cloud into the air and my folks came into my bedroom to be with me and say their goodbye ‘s as they thought we were getting bombed by the USSR. I was 6 at the time, slept through the explosion, but woke up when they were hugging and kissing me goodbye. Once I found out what had happened, I was out the front door in my pj’s and my poor folks had to run to keep up with me, lol…………. Thanks for the reply Fred. Sorry to hear of your Dad’s passing. I remember the houses moving by my house quite often prior to the construction of 205. I lived on top of the bluff at 87th and Holgate from birth to 1979. Sadly, the next owners had to go into foreclosure and remained empty (with occasional squatters staying there) until it was eventually torn down to build 2 very narrow row houses. Yes, my Mom told me that it was a huge explosion. A few years later during the Columbus Day storm my Dad was chasing his carports fiberglass roofing material down 87the towards Marshall HS haha. I remember the grass fields that were to become Eastport Plaza. As a kid I would ride my bike there to catch garter snakes. Our family lived west of 82nd on 63rd north of Foster. I remember the fireworks warehouse explosion as well. I think there was a night watchman that was killed. My dad too thought we were under attack and I remember seeing the mushroom cloud. I remember a Piggly Wiggly on the N.W. side of 82nd and Powell…late 50’s and the White City Motel on the N.E. side of 82nd and Powell.